Ukrainian lawmakers are poised to approve sweeping patent reform legislation, driven in large part by a push by patients’ groups for better access to affordable medicines and healthcare. The All-Ukrainian Network of People Living with HIV/AIDS (Network) spearheaded the initiative, supported by other organisations, Network Head of Advocacy and Legal Support Unit Sergey Kondratyuk said. In 2015, the groups reopened technical discussions originally launched by the United Nations Development Programme (UNDP) and others on access to medicines and intellectual property (IP) issues. The Network scheduled a national meeting and invited international experts to help with capacity-building and information, including on the 1994 World Trade Organization Agreement on Trade-Related Aspects of Intellectual Property Rights (TRIPS) and the so-called “TRIPS Flex” provisions on improving access to medicines. Since then, a working group has been considering provisions related to access to medicines as well as patent law reform, Kondratyuk said in an interview. Ukraine signed an Association Agreement with the EU in 2014, followed in 2016 by a Deep and Comprehensive Free Trade Agreement. Both documents are available here: http://ec.europa.eu/trade/policy/countries-and-regions/countries/ukraine/. Under the terms of the agreements, Ukraine must partially align its IP rules to those of the EU. On 6 July 2016, an intellectual property rights dialogue took place between EU and Ukrainian officials. As noted in a post by Make Medicines Affordable (MMA), a coalition working to make essential HIV medicines more affordable to patients (of which the Network is a member), EU and Ukrainian representatives split over issues such as compulsory licensing and data exclusivity. Civil society groups accused the EU of representing the major drug companies, and urged Ukraine to use the TRIPS “flexibilities,” rather than TRIPS provisions, in national legislation, MMA said. TRIPS requires patenting for all fields of technologies, Kondratyuk noted. Pharmaceutical drugs could not be patented before TRIPS entered into force, but now any country that accedes to the pact must comply, meaning Ukraine has had to patent drugs. TRIPS Flex provisions, on the other hand, are mechanisms aimed at improving access to medicines, including patent opposition proceedings. TRIPS-plus provisions, on the other hand, provide stronger IP protection than TRIPS, he said. The EU-Ukraine agreement contains several provisions that go beyond TRIPS, such as patent term extensions, he said. From the perspective of access to medicines, TRIPS-plus or any stronger IP protections disadvantage patients, said Kondratyuk. There, Kondratyuk argued that big pharma companies are “lobbying in Ukraine for full harmonisation with the EU data exclusivity regimen,” which would mean extending their monopolies on medicines from five to 10 years even in the absence of patents. He urged the government to oppose the move. Participants agreed there were gaps in national IP laws that limit patients’ access to drugs and which should be quickly mitigated by limiting TRIPS-plus provisions and putting in place effective compulsory licensing measures. The discussion prompted the drafting of proposals to revamp Ukrainian patent law to increase access to medicines. The push for access to essential medicines advanced in March 2017, when MMA and the Network hosted a discussion on the international experience of pharma patent applications examination. There, as MMA noted, Network Intellectual Property Counsel Mykyta Trofymenko criticised decisions of the Ukrainian Intellectual Property Institute in granting “two questionable secondary patents for lopinavir/ritonavir,” resulting in the country paying too much for the HIV/AIDS drugs. By contrast, he said, the office’s decision to refuse patent applications for hepatitis C drug sofosbuvir led to a price reduction. In April 2017, the Ministries of Health and Economic Development and Trade created a joint working group on issues related to IP and access to medicines and agreed to take part in patent reform activities, according to MMA. Current statistical information regarding the granting of patents reflects large gaps in Ukraine’s national patent regime, said Kashyntseva. WIPO statistics on healthcare patents granted in Ukraine from 2001 to 2015 show that 5.09% of the total number of granted patents involved pharmaceuticals, with 8.22% coming from medicines, she said. Ukraine’s percentages are higher than those for Germany and France, among others, she noted. Despite the fact that the Patent Office has “very strong experts,” they do not have sufficient legal instruments to ensure the granting of high quality patents, she said in an interview. Given these circumstances, the key points of patent reform are, first, to implement pre- and post-grant oppositions to patent applications and patents as in EU legislation, and then, under the country’s Association Agreement with the EU, to ensure consistency with the 2001 TRIPS Agreement Doha Declaration on patents and public health, said Kashyntseva. In addition, the reform measure puts in place the “Bolar exception,” which creates a presumption that it is not an infringement of a patent right’s holder to study or submit information on a medicinal product before the patent expires. Widely recognized in the US, EU and Canada, the exception allows generic drug makers to begin filing for marketing approval before the expiration date of a relevant patent, allowing the drugs to reach patients as quickly as possible, said Kondratyuk. The draft measure also calls for holders of patents for medicines to be given the right to extend the validity of the patents via supplementary protection certificates for no more than five years, said Kashyntseva. And as in other European countries, the draft bill excludes from patenting surgical or therapeutic methods of treating people and methods of diagnosing an organism of a person. Patient groups want very strict patentability standards because of the country’s limited access to medicines, most of which are generics, said Kondratyuk. Given the circumstances, it’s important that any patents granted be high-quality, particularly for medicines, he said. If patentability requirements are applied in Ukraine as tightly as they are in Argentina, Brazil, India and some other nations, many low-quality patents will be avoided, he said. Asked whether he expects opposition to the patent reform bill, Kondratyuk said he has not seen any from pharmaceutical companies. Drug originators who use the patent system extensively as part of their business model push for greater IP protections, but Ukraine lacks an adequate budget for even some basic medicines, he said: The healthcare system is underfunded, with some 90% of costs related to medicines and devices borne by patients. In the absence of tougher patenting standards, the Network has taken on several drug manufacturers in an effort to lower prices for HIV/AIDS. The Network started asking ViiV Healthcare in 2014 for a license for Ukraine through the Medicines Patent Pool (MPP) for abacavir and dolutegravir (DTG), both antiretroviral medicines, said Kondratyuk. In early 2016, it organised a meeting with ViiV and the Ministry of Health at which it requested the drug manufacturer either to provide a license or cut its prices, or face government-ordered compulsory licensing, he said. In April-June that year, Ukraine was included in the DTG license and given a non-enforcement letter for ViiV for abacavir. ViiV included Ukraine in its MPP DTG license in April 2016, he said. 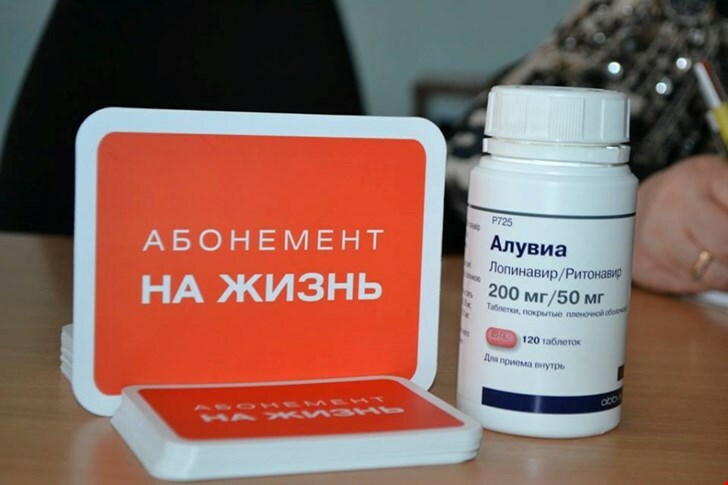 Last July, the Kyiv City AIDS Center received the first batch of DTG, transferred by the AntiAids Foundation. The shipment represents the first time in Eastern Europe that HIV-positive patients received antiretroviral therapy paid for by private rather than public funds, the Network said. As of 1 January 2018, nearly 3,000 patients were receiving treatment, Kondratyuk said. A lengthier fight has played out over lopinavir/ritonavir (LPV/r). In May 2106, the Network filed a lawsuit in the Kyiv Economic Court of Appeal seeking to invalidate the patents for LPV/r (Aluvia). It claimed that the disputed patents don’t meet the legal requirements of novelty and inventive level, and that the legal monopoly of the company-patent holder (AbbVie Inc., USA) allowing it to overprice the drug is unlawful. If the patents were cancelled, the cost of the drug would drop from $19.5 million per year to $6 million, potentially enabling 125,000 more HIV patients to receive free treatment. In March 2017, the court dismissed the lawsuit, holding that the patents do not violate the rights or the legally protected interests of the plaintiff as a patients’ organisation and that the claim that cancellation of the patents would reduce prices was unproven. That ruling was overturned in July by the High Economic Court of Ukraine. Following several more skirmishes, the appeals court has now set a judicial examination of the patents’ validity to be conducted within four to five months, Kondratyuk said. "Ukraine Eyes Patent Law Reform After Civil Society Push On Medicines Access" by Intellectual Property Watch is licensed under a Creative Commons Attribution-NonCommercial-ShareAlike 4.0 International License.